 Home  iOS 7  iOS 7 Jailbreak  Jailbreak 7.0.4  JAILBREAK IOS 7  Jailbreak iOS 7 - iOS 7.0.4 / 7.0.5 iPhone, iPad, iPod Touch. If you want make jailbreak iOS 7 - 7.0.4, you do not need special programming skills or knowledge of machine code - you just need to click one button in the IOS 7 jailbreak tool - Evasi0n7. It can make any user. 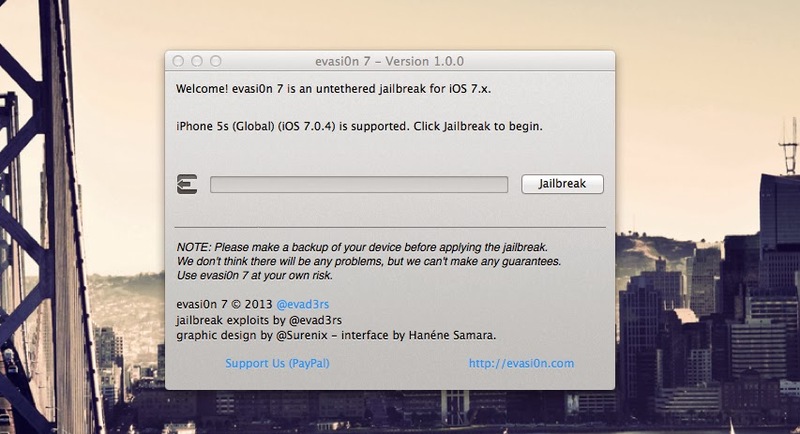 New jailbreak iOS 7 tool Evasi0n7 compatible with all versions of iPhone, iPad and iPod touch. !!! Before you perform a jailbreak, it is recommended to download/install the latest update iOS 7.0.4 from here. (for testing iOS 7.1 beta with many users having problems). Practice shows that the chance of successfully hack firmware increases when installing clean OS, and not through the update function by air from Settings - > General - > Software Update. In other words, the first on the iPhone and iPad should install OS 7.0.4 - 7.0 again using iTunes 11. !!! You must to disable the password lock screen on iDevice. * iPhone 5s, iPhone 5c, iPhone 5 , iPhone 4S, iPhone 4 , iPad 2 , iPad 3 , iPad 4 , iPad Air, iPad mini, iPad mini 2 or iPod touch 5. * Computer based on OS X 10.5 / 10.6 / 10.7 / 10.8 or PC with Windows XP or higher . * USB- cable to connect your smartphone or tablet to your computer. Step 1: Download the latest version of iTunes 11 and Evasi0n7 (link above this post). Extract the archive and run it as administrator. Step 2: Connect your iPhone, iPad or iPod touch to your Mac or PC, click the iTunes and make a backup copy of the data . Step 3: Make sure that the password on the device is disabled . Step 4: Evasi0n7 detects the device model . Button «Jailbreak» window becomes active , click it. Now the application will perform hacking, reboot the device and download the installation packages . The procedure can take some time. In any case , do not interrupt the installation. Unlock your gadget and get on your dagdets’s desktop a new icon «Jailbreak». Click on it. IPhone or iPad screen for a few seconds will turn white , and then will springbord . Step 6: Evasi0n continue to jailbreak iOS 7-7.0.4: appears on the screen overhead information about the process of jailbreaking . Step 7: When you see the message Done, the program can be closed. Now your device will reboot. Device startup process may take a long time (2 -3min) . Step 8: After downloading, you will see the logo on a white background Evasi0n . Your device will reboot a second time. Step 9: Congratulations, you have successfully done jailbreak iOS 7-7.0.4 on Windows or Mac! 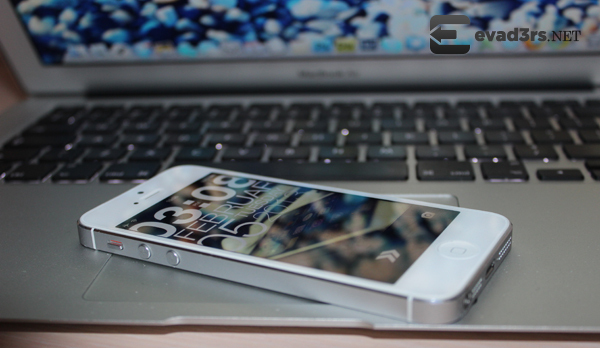 Open your iPhone, iPad or iPod touch and run Cydia! Note: If after jailbreak iOS 7-7.0.4 arose cyclic reboot (on the iPhone or iPad for a long time, "floating" logo Apple), switch the device into recovery mode. To do this, hold the power button and the Home button simultaneously until the screen turns off while , then release the power button but continue holding Home for another 20 seconds.) Now connect the gadget to your PC and run the recovery device through iTunes. Repeat jailbreak iOS 7-7.0.4.